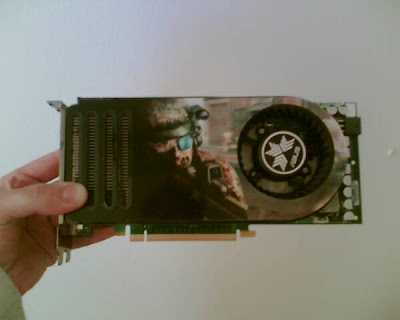 I bought myself a new graphics card. 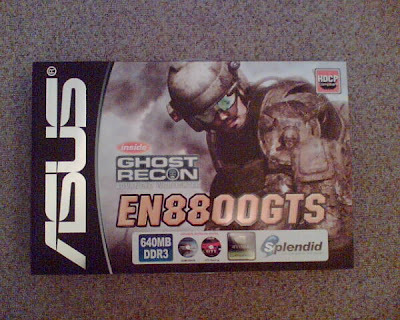 My new graphics card is the ASUS EN8800 GTS 640 MB DDR3. For now this is enough. Excellent Performance and "could be a very little bit worse" energy appetite. This thing realy needs 3 cables of electricity. 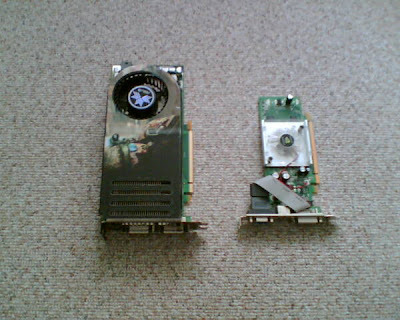 And then again compared to my old GEFORCE 7500 LE 512MB. Just installing it tomorrow and some serious gaming is coming up. I have started Part Three. From "Ushan - the Return"
Make anger return to your people forsaken. the treasure, thats lost, when found we will chill. then space, time and life and everthing bleeds. and is building a tower to withstand the storm. and there we will finally find our truth. Hey guys - this is my 50th post in this blog and i am proud to aanounce that i just put the point to the last sentence of Part Two of my book on page 302. I almost forgot how i felt when i finished Part One. But know it is the same - i am happy and very sad in one. Happy that i finished and sad that i again must now leave the people i have written about, their hopes and fears and adventures. I shouldnt have made the concept of the book in 3 parts, because it hurts so much when i have to break the connections to everthing i have written about so far and focus on something new. In the next couple of days i will begin with part Three and slowly but firmly approach the epic end.